The culmination of the work of over 400 volunteer surveyors from 2007 to 2011, The Birds of Berkshire, is a full revision of the first edition, which was based on fieldwork twenty years earlier. The new Atlas and Avifauna provides accounts of the 328 species recorded in Berkshire up to 2013, describes the changes that have occurred over the last twenty years and discusses their causes. There are chapters on the history of ornithology in Berkshire, on geography, habitats and climate. For bird-watchers less familiar with the county, the Atlas “Where to Watch” section provides information on nature reserves and other sites of special ornithological interest. The results show dramatic changes compared to the last Atlas surveys carried out in 1987- 9, with some species becoming extinct as breeding birds in Berkshire and many new or expanding breeding species. With a foreword by H.R.H. The Duke of Edinburgh, The Birds of Berkshire is a large format, full colour book of 520 pages. As well as over 600 maps and figures, it is illustrated with line drawings of each species and 150 photographs of many of the species and the key habitats. 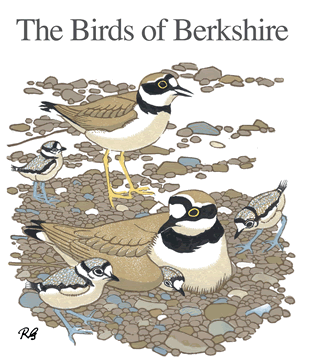 The second edition of The Birds of Berkshire was published in 2013 by the Birds of Berkshire Atlas Group, Reading, UK. Authors: Neil Bucknell, Brian Clews, Renton Righelato and Chris Robinson. Editors: Neil Bucknell and Renton Righelato, Art Editor, Colin Wilson. Design and production by Rob Still, Eye on the Ball, Old Basing, Hampshire, UK.